MEP Hangers (previously named Smart Hangers) enables the instant large-scale insertion of hangers and supports throughout a Revit® model for ducts, pipes, cable trays, and conduits. You get accurate bills of materials and builders work drawings, and accurate on-site assembly thanks to BIM-to-Field features. 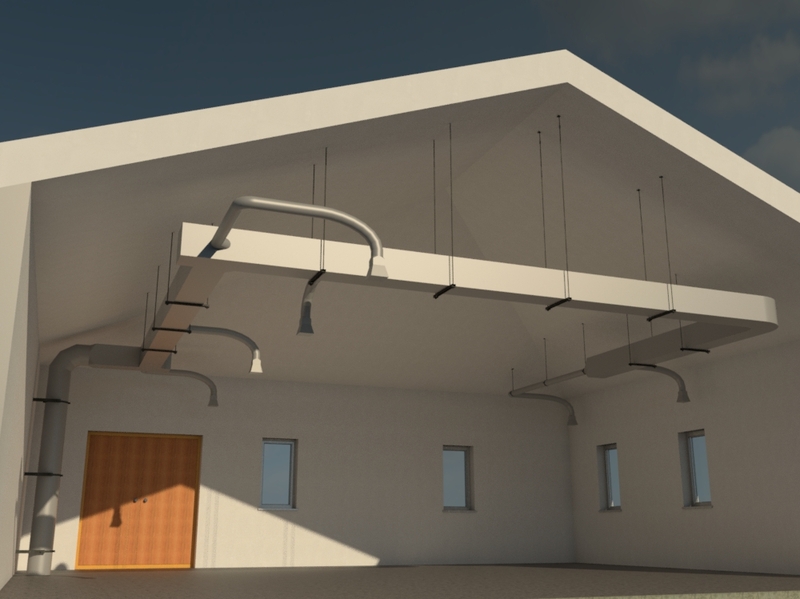 The software uses simple yet highly flexible rules to select the relevant Revit® MEP systems and add (or modify) needed hangers or supports with their various connections. They can be distributed as a fixed number per segment or based on the distance between bearing points. MEP Hangers can split ducts, pipes, cable trays, and conduits into predefined lengths as needed, and marks all service components for fabrication. For on-site precision and efficiency, it exports bearing points to Trimble or TopCon tools and drilling robots. *Please note that MEP Hangers is not a family library. To help new users get started with the software, however, a complementary selection of families is provided upon license purchase. If you have hundreds or thousands of hangers and supports to insert into your Revit® model, MEP Hangers is just the solution for you. Automatically distributes hangers and supports throughout a Revit® model for ducts, pipes, cable trays, conduits, and line-based generic model families. Uses predefined and customizable rules to distribute exactly the way you need. Automatically sizes hangers and supports according to MEP service size. Automatically connects to architectural or structural elements (like walls, floors, roofs, beams, etc.). Automatically adjusts to accommodate sloped MEP services or sloped structural elements or reference planes from the current or a linked project. Splits MEP services into segments by predefined lengths that come from the manufacturer. Enhances BIM teamwork and deliverables for integrated project delivery (IPD). Works with IFC format files! Gravity point foundation according to hanger material. When the time comes to distribute hangers and supports in YOUR project, save hours of painstaking manual work. Let MEP Hangers do it for you! Time to distribute 100 hangers? Less than 5 seconds. Incredible performance increase. Thousands of hangers can be added in a matter of minutes, on average workstation. What took hours or days is done in fraction of that time. Time saving, up to 10 times. Distribution of hundreds elements with one click. Versatility. Change, update, and connect hangers to whatever you want. Make custom hangers and use them in your own project. There are no limits to what you can do with Smart Hangers when you want to distribute hangers in a project. Easy to use. To get to know the software user needs only a few minutes of training that is available in video format. For more experienced users there’s no need to read any help files or watch videos. It works out of the box and on any project, so it only takes installing and you can start working. Manage changes. If any changes are made in MEP system, Smart Hangers helps user update hangers quickly. Easy selection and filtering. There are lots of different selection and filtering capabilities in Smart Hangers. If there’s a need to select hangers on particular MEP element or if there’s a need to select hangers on filtered elements, Smart Hangers will easily help with that. Lots of modification capabilities. A lot of problems come up when coordination of a lot of elements is needed in a project. For that, Smart Hangers has its own platform where user can create parameters and change their values. Smart Hangers also works with custom hangers, there’s only a set of parameters needed for them to work and those can be taken from template database. Easy start up. To start working with hangers, no prerequisites are required. Just load wanted hangers into a project with Project Family Browser and start the work immediately. Sample library with 25 different detailed hangers for ducts, pipes, cable trays and conduits are provided free of charge to permanent license users. Fast scheduling. To make a list of views and schedules of a particular hanger assembly or a set of them, just select the hanger (or set) and click to create assemblies. - Mike McGinn, Building Information Modeler / Plumbing Designer at PACE Collaborative, USA. "Our company utilizes both Smart Sheets & Smart Hangers heavily. Smart Hangers has saved us countless hours placing hangers on piping & ductwork. There is a small learning curve, but AGACAD was there to help explain & make recommendations based on our company’s needs. (...) We would recommend these products to any company that places hangers or works with larger scale projects." - Alex Mak, BIM Operator / 3D Modeller at Entire Fire Protection Pty Ltd, Australia. "We are very pleased with Smart Hangers software and customer service at AGACAD. Prosperities of the Smart Hangers: •	Easy of installation; •	Great time saver, especially on the undulating/sloped ceilings and where there are many changes in the ceiling levels; •	Fairly straight forward/user friendly to navigate and modify hangers and supports; •	Very easy to Model; •	Plenty of options/parameters to automatically distribute hangers under various structural, practical and aesthetic conditions; •	Ability to calculate Hanger Elevation from Level from software automatically; •	Automatically update with changes in the model."